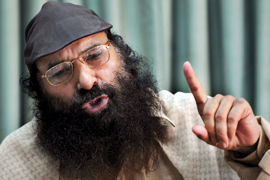 "Dialogue is useless, armed struggle will continue"
Peace will elude Kashmir until separatists are involved in the dialogue process, says Hizbul Mujahideen chief Syed Salahuddin. He spoke to Aditya Raj Kaul on phone from Muzaffarabad a day ahead of the Indo-Pak foreign secretary-level talks in Delhi. The Pakistan foreign secretary is in India for talks and he would be meeting all separatist groups. How do you see this meeting? I think meeting with Hurriyat leaders before Indo-Pak secretary-level talks is good, but the basic issue is that the Kashmir dispute is tripartite. No effort will yield results until all three parties concerned are involved. It is not a border dispute between India and Pakistan that two foreign secretaries or heads of state can resolve it. Nor is it an internal security issue. There has to be a realistic approach to the problem. Has this dialogue process been of any help? You say tripartite talks are necessary. The government says you should give up arms and surrender. These are talks only for the purpose of talks or to just keep the stakeholders engaged. It has brought no result in the past nor will it do so in the future. During the past 65 years, hundreds of such exercises have been undertaken. But what is the result? The issue has to be resolved in a realistic way. India and Pakistan both have to agree that Kashmiris are the principle party to the dispute. Till they carry on bilateral dialogue, there will be no result just like it has happened in the past. There will be no breakthrough. Is Hizbul ready for talks with India? That is of no importance. India should first agree in principle that Kashmir is a disputed territory which has to be resolved as per the United Nations resolution. It is immaterial whether it is Mirwaiz, Geelani or Syed Salahauddin. It does not matter who represents Kashmiris in these talks. The core issue has to be resolved in a practical direction and that is our demand. Hizbul or any other group coming to the table is not of specific importance. In the process of dialogue, everybody (separatists) should be supported. Hasn't this 23-year-long bloodshed and its high human cost gone against your cause? I don't agree. Unless and until the democratic approach is respected and honoured, the armed struggle will remain relevant. The people of Jammu & Kashmir, during the last 65 years, have never compromised on their basic demand for right to self-determination. India, by using force, has tried to crush the sentiments of Kashmiris but it has been an absolute failure. Until India respects the aspirations of the people in Kashmir as per the commitment of Pandit Jawaharlal Nehru and others which were made in the presence of the international community, armed struggle will continue. It will be a statewide political armed movement in India till Kashmir remains a territory under the control of the military. Indian authorities are not serious about resolving the issue but are only buying time. How can we nullify the validity and relevance of the armed struggle? It remains important. The international community too has come to know of India’s militarisation in Kashmir. The military cannot be eliminated without our armed struggle. We have seen the successful role of armed struggles in Afghanistan and Iraq. We are well-wishers of our Indian brethren. If India accepts the reality of the Kashmir issue there will be no need for an armed struggle. But if India continues to use its military against the people of Kashmir, there will be no alternative to the gun. Lashkar-e-Toiba and Indian Mujahideen have been in the news lately because of their violent activities. Have they taken over Hizbul Mujahideen? We have tried our best and given everything to the movement. Hizbul Mujahideen is a militant organisation of local cadres. There was a time when Pakistani elements were in it. There are thousands of families who refused to stay under suppression on the Indian side of Kashmir and migrated to the Pakistani side in the last 40 to 45 years. We are half a billion people of Kashmiri origin. We are living in Pakistan Administered Kashmir and other parts of Pakistan. They are as much Kashmiris as any other Kashmiri living in the Valley. There is just physical distance. We are indigenous. The foreign elements in our group are negligible in number now. At the present time, I don’t think any non-local person has a role in insurgency in Kashmir. The J&K government has said that infiltration has drastically reduced in the last many months, and only a few hundred militants are left in the Valley. Is it true? If militancy has come to an end, tell me why are more than 7,50,000 Indian troops deployed in Kashmir. What is the purpose of them being there? More and more troops are being created in the name of Rashtriya Rifles, Indian Army and Task Force. More civilians are being targetted. There are so many innocents who have lost their lives in prisons in Kashmir. What is the need of this huge army deployment if peace has returned to Kashmir? You have alleged that the 1987 J&K elections were rigged by the National Conference, which resulted in this brutal cycle of violence. Had there been no such episode, would Kashmir have been different today? In the 1987 elections there was mass rigging when I contested as part of the Muslim United Front. Farooq Abdullah, the Congress government and others cornered us illegally. People lost trust in them. For overall change we had to go in for armed struggle. We had no option left. The struggle, which has been going on for 23 years, is a result of the ways in which the confidence of the Kashmiri youth in the democratic process was shaken by the leaders of the National Conference and the Congress. But this was certainly not the only reason why things turned out the way they are today. There were many other crucial factors that led to the armed struggle in Kashmir.